- Camping & Fishing: As a reusable long lasting ice replacement for coolers, cooler bags and Ice boxes for keeping food and drinks both hot or cold. - Picnics: Can be cut to size and wrapped around Food &amp; Drinks which not only gives maximum surface contact but also keeps stuff colder longer. 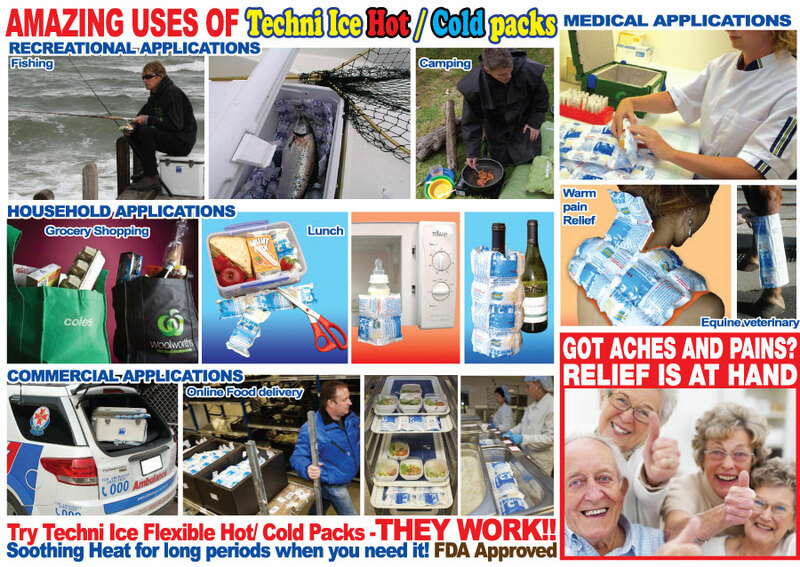 - Children: Techni Ice can be cut to fit any kids lunchbox to keep food cool or hot. - Shopping: Ideal to bring frozen food and ice cream home from the supermarket. - Electricity: During blackouts for taking Techni Ice from the freezer & placing in the refrigerator to keep refrigerator cold while electricity is off. - Transport: All perishables, including meat, fish, fruit, vegetables, cut flowers and chocolates etc. - Catering and Deliveries: Consumer deliveries such as pizza and diet meals and pre-prepared food, which require food to be kept hot or cold. - Medical: Leading Pathology Labs Across the world use these in Transportation of samples, e.g. blood, tissue, medicine, e.t.c. - Hospital: Hospitals around the world Cut these flexible dry ice packs to size for the reduction of swelling after surgery, or for perineum after childbirth, after an epidural as an ice-cold test, e.t.c. - Veterinary: Used as a flexible heat pack, to keep bedding warm for post operative and sick animals. - Veterinary: Transporting Pathology Samples. - Horses: A flexible dry ice gel pack to mould around horses legs (the cannon area).